The namesake Joshua trees make an immediate impression, with their spindly branches and tough, cactus-like leaves, creating the impression you’ve stepped into the world of Dr. Seuss. In the park, these trees surround giant clusters of boulders, placed perfectly atop each other with the precision and mystery of Stonehenge. 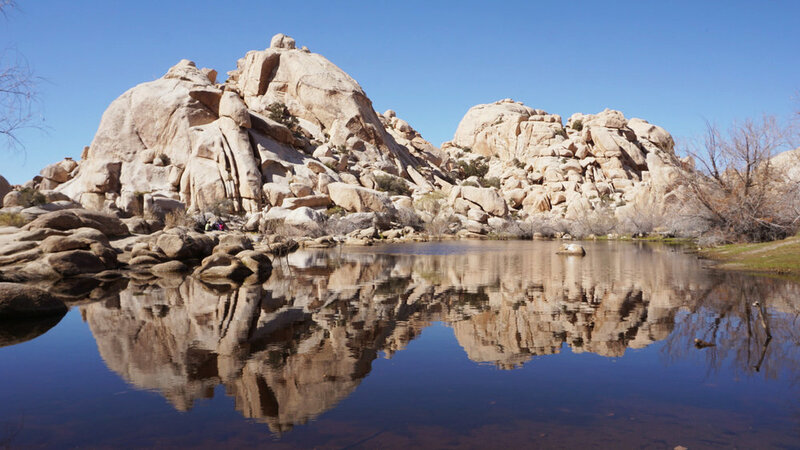 Between the appeal of Joshua Tree National Park, the surrounding village, the high-desert movie backlot of Pioneertown and the strange and stunning architecture and artwork nearby, you’ll find plenty to do on a day trip to this magical place. Discover the craftiness of some unique desert-dwellers at the World Famous Crochet Museum (it’s just what it sounds like) or the Outdoor Desert Art Museum, a 10-acre sculpture garden made from recycled trash. Take a beat off the Twentynine Palms Highway Trail and head up to Pioneertown, a small village created as a wild west Hollywood backlot in the 1950s for Gene Autry. Most of the buildings on the street are merely false fronts, but one intrepid dream catcher artist, a leather worker and a few lonely desert rats have populated the real streets surrounding this faux-town. And right next to the Pioneertown Motel, honky-tonk roadhouse Pappy + Harriet’s serves classic barbecue and nightly live music that will knock your socks off.